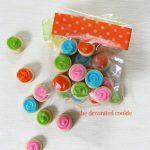 Canvas cookies: Decorate-your-own art canvas cookies for art party favors. 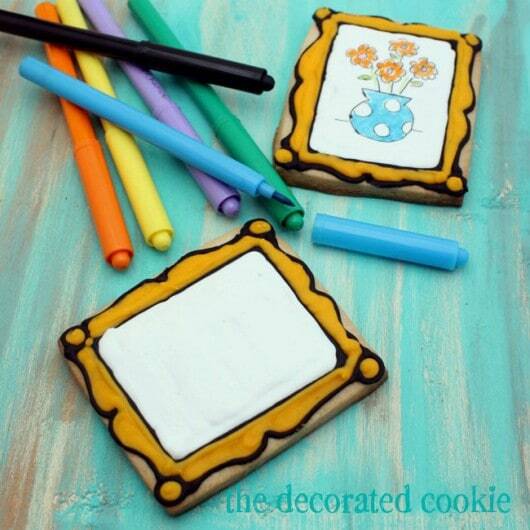 How to make blank art canvas cookies to package as art party favors with food coloring pens. I made these decorate-your-own art canvas cookies as part of a birthday present for my niece’s seventh birthday. Seven years goes by in a flash. She’s the oldest of my nieces, and I remember her resting on her Boppy like it was yesterday. This little girl eerily reminds me of myself as a child. Partly because she’s so kind, responsible and impressively aware of others’ feelings (did you catch that self-congratulation there?). But also because I recognize her compulsion to draw. I was exactly the same way. I doodled and drew and copied cartoons, too… I could whip up a mean Garfield. Since I sadly had to miss her art-activity-filled birthday party this year (I wanted to go just as much, if not way more, than my own daughter), I decorated these “Make Your Own Art” canvas cookies for her. 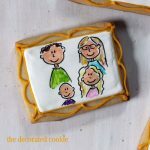 Design your own canvas cookies? I can’t think of just the right name. 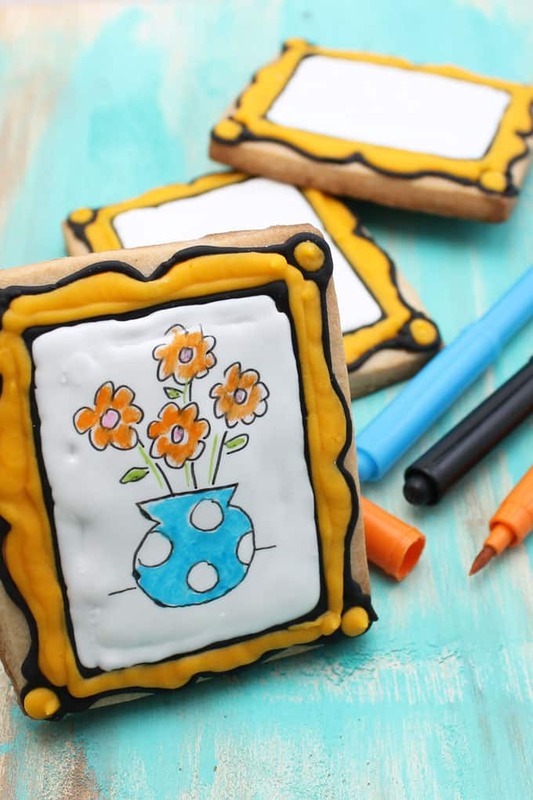 The cookies were accompanied by a set of edible markers, of course, so she can draw her own sweet art on the canvas. 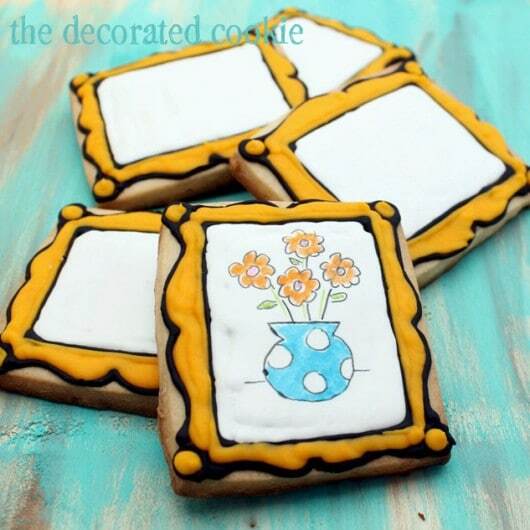 Check out how to wrap these cookies as art party favors here. To make these, I cut out rectangles from my cookie dough. Then I prepared my royal icing and tinted it white, black and gold using my trusty Americolor Soft Gel Pastes (Bright White, Egg Yellow and Super Black). Then, I prepared two disposable decorating bag with couplers and tips, one with a size “3” and one with a size “4.” I filled the decorating bag with the “3” tip with black and the one with the “4” tip with the gold, and tied closed tightly with rubber bands. To decorate, I outlined the rectangle and frame with black and let set. Then I thinned the white icing a bit, filled an empty decorating bag, snipped a bit off the tip, and flooded the center with white icing. I piped to fill the frame with gold icing. (For basic cookie decorating how-tos click HERE.) Let the cookies sit at room temperature uncovered overnight until they dry very well before packaging. Include a set of edible writers with the gift. Happy birthday to my sweet and creative niece!!! How fun! I bet she loved them! I did something similar for my son this year. Gave him a plain white fondant cake and a pack of edible markers. He and his friend had a blast decorating it! I just remembered that I did this years ago, too! For my daughter. 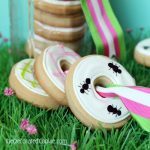 But without the frame… https://thedecoratedcookie.com/2010/06/cookies-by-kids-a-fathers-day-gift-idea/ Yikes, I’m at the point of recycling, I guess!! I think this is an awesome idea…adding the frame is so creative. 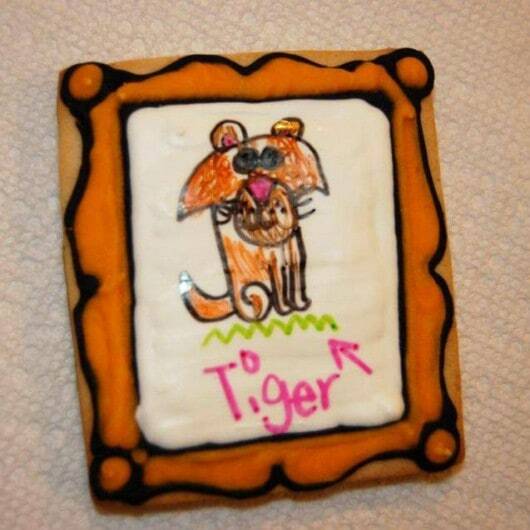 Cookie art by kids – what fun! Thanks Meaghan! What a great gift for your niece and what a sweet idea for any child who loves to create (and what child doesn’t?!) 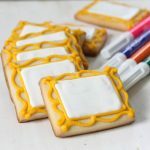 The frames are adorable and I can imagine how excited a little one would be to have their own set of edible markers to create their own little masterpieces with. I love this idea! This is simply THE BEST gift idea ever! I am going to put this together for my munchkins! I am so excited! This would have been PERFECT for the art party I held for my daughter last year. Love the idea. What a great idea! I’m sure she loved them! What a fabulous idea. My daughter would love this!!! OH my goodness! These little canvases speak to me! I’ve seen this done on cakes before but doing it on cookies instead makes it such a great gift idea! Especially with the frame. The frame is what makes this cookie present so awesome!!! Definitely a keeper! I absolutely love this idea. Have to keep it in mind for my grandson when he gets older. Its really a wonderful idea. Such an adorable idea! Love it. I love this idea. Such a fun activity for kids. This is such a great idea! Can these cookies be frozen once they are decorated? So cute! I just did this for Easter with my daughter. I love your picture frames … gotta try this!